BEFORE: Capote has been on my list for a while for one reason; Philip Seymour Hoffman. Last seen in Charlie Wilson’s War, Hoffman is one of my favorite actors so I can’t wait to see his Oscar-winning performance. AFTER: I didn’t know much about Truman Capote or his groundbreaking novel In Cold Blood until this spring when not one, but two of my professors mentioned his work. At the time, I didn’t think much about it and didn’t really see the significance of what Capote did. But after seeing Capote which details the six year process of researching and writing In Cold Blood, I’m thinking differently. Right from the opening shot, I was completely hooked. Capote isn’t just an biographical film; there’s also some elements of mystery. Capote isn’t sure of how he wants to write this story of a family’s mass murder and the film follows his journey as he himself changes as he gets closer and closer to the story and the convicts. And then there is Hoffman’s performance which is deserving of his Oscar. It really is unlike any of Hoffman’s other roles and yet he does such a great job portraying the trauma Capote experiences as the story unfolds. 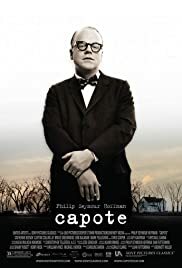 Especially at the end, Capote remains mostly silent yet Hoffman is still able to express as much if not more than he did at the beginning of the film. A minor complaint I have is with the elapsed time. Capote starts the night of the murder, November 16, 1959 until the publication of In Cold Blood in January 1966. That’s a six-year timespan but the film only feels as if it was weeks or months. The information is still conveyed but in what feels like a condensed fashion. It makes it harder accept the changes Truman Capote goes through as opposed to what would feel totally natural over the course of six years. Regardless, Capote is a very good and multi-faceted film. It doesn’t just focus on the murders and the killers but takes a long look at Capote’s alteration as well. And, of course, there’s the added bonus of Philip Seymour Hoffman.